But I just want to make one observation: This concert was at the National Auditorium (Auditorio Nacional), with capacity of more or less 10,000 people (the concert was sold out). It was not at Teatro Metropolitan, which is a smaller venue, with capacity of 3,000 people, (not 1,800). 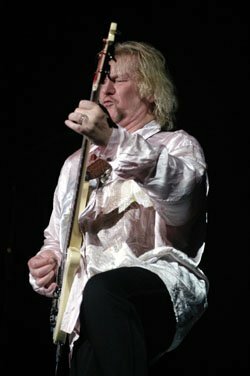 Hi to all Yes fans in Mexico and all over the world! First of all I'm a really true fan of the younger generation (I�m 29), I guess that's why I can accept Yes in any of its incarnations. But there is no doubt, what we just saw last night is the greatest Yes of all. 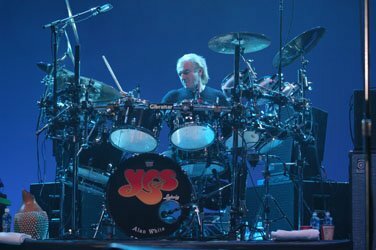 This was my 4th Yes concert and I still can�t believe what I saw and heard, this guys are tremendous on stage and no record or video can completly capture the experience of seeing Yes performing live. The Yesimphonic video is great and I enjoyed it (must of all because I'm a musician and had the opportunity of playing in an orchestra and I know exactly what thats all about), but it's much better to watch them, to feel, to live them there, face to face. 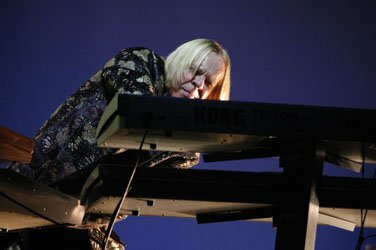 For me it is a dream come true to be there again and to see Rick Wakeman back, I think mexican fans will agree with on that. Especially because when I started being a Yes fan (since 1990), I knew that I maybe never would be on a Yesshow, much less that they would come to M�xico (I was certain that I was the only crazy guy in this country that liked this kind of music). And now this is the 3rd time around. And I wasn't alone: 10,000 people singing and dancing and celebrating the greatest band on earth. It was incredible that everybody was singing Heart Of The Sunrise, my one time favorite until I discovered Awaken, wich they also played last night, and I most say that I was expecting that one since the last time they came to Mexico. Now my life is complete, because that song, besides of being a great if not the greatest masterwork from Yes, the song personally hits me very deeply... "deeper than before" (as the song goes). 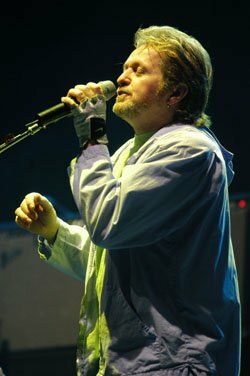 One of the highlights for me is was of course South Side Of The Sky, wich I think it wasn't played in its original form since it's birth on the Fragile album (did you realise that this year marks the 30th aniversary of the record and that they played last night almost completly?). Anyway, I could keep writing on and on, Yes is such an inspiration for me as a musician, but must of all as a person and I feel very lucky to live in the same time they're living and I'm encouraging other fans to see them while they're still on this earth, I really would call them angels on earth, they have the touch of God that many other groups and musicians today would like to have. Thank you Jon, Steve, Chris, Alan and Rick, you really touch the people's hearts, including mine, not an easy task to do. I must have to start my review at 1:50 pm, sunday, december 8, when I saw Mr. Wakeman coming out from the elevator in the hotel the band stayed. Damn, I was amazed!! Mr. Wakeman was infront of me and he gentely shaked my hand and gave me an autograph at some artwork I had with me. After the sign, I wanted to told him something, but the words never came!! 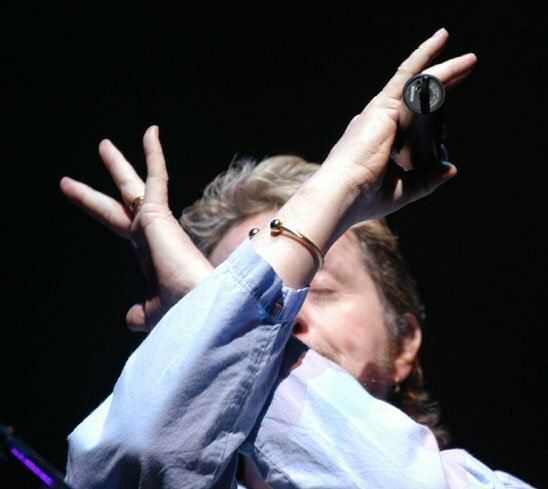 So I just said �Mr, Wakeman, thank you very much� I�m speechless, so have a nice day and see you at the concert!! He just smiled, shaked my hand again and waved goodbye�. God, what a way to start my autograph hunting!! Later Mr. White came across, and after the autograph, I asked him about if the band will be playing CTTE, and he said � Sure, we will play the full set list tonight, including CTTE and Awaken�, and his wife was there too, and she told me that she and the band loved M�xico, because it�s a beautiful country and the people here are wonderful, and because they all can see and feel the love and respect we feel for the band. Minutes after that, Mr. Howe came out from the elevator, and me and Luis Atti� (a very good fella I meet there) went to Mr Howe and he asked us to wait a few minutes. One minute later, Mr. Anderson came out too and both of them gave us their autograps, and I asked Mr. Anderson if they will be playing �Starship Trooper� , and he said �Maybe, maybe, maybe! !� with a big smile on his face�. Damn!! Is the 4tth time I meet Mr. Anderson and he keeps amazing me again and again with his face full of peace and love!!! We asked them for a pic, but they both refused to have a pic with us, so we just shaked their hands and they waved goodbye. 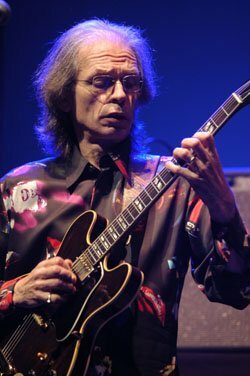 About 30 minutes later, after have a meal, Mr. Howe went up to his room and then came down again carrying a guitar case, so I asked him about his Gibson ES-175, and he said : �It was here before� and I said � No way!! Not in the 2 times before! !� And he was in doubt� and then he told me �well, today it is here, so you will see it! !� and he left smiling.. what a guy!! Later, Mr. Squire came out and he was very kind to us, and he was able to have a pic with us, and he loved my artwork!! And then I had a picture with Mr. White too. Yes, they were using a tape for the backing vocals of �We Have Heaven�, and the duel between Mr. Howe and Mr. Wakeman at the end of �South Side of the Sky� WAS AMAZING!!! WHAT A WAY TO PLAY!!! I�M STILL FEELING THE ENERGY!!! And it was and standing ovation. Mr. Wakeman equipement was great, he sounded amazing and powerfull�. 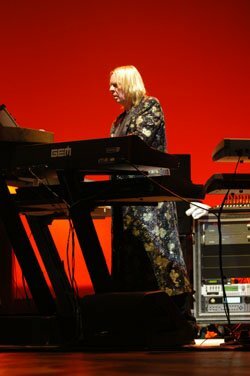 And yes, he was using an old analog device for some solos, and during �CTTE� the place was jumpin�up for the vibration and the volume of Mr. Wakeman. At the beginning of �Heart of the Sunrise� we all were singing softly (love comes to you, and you follooooow�. ), and Mr. Wakeman was amazed for that!! He started to wave his arms like an orchestra leader leading our chants and he was looking at Mr. Squire like saying �look at them, they know all the lirycs! !� or something like that.. he was very happy and surprised by that. �Awaken� was not a song at all� it was a trip to the arms of God, like born, die, and make love at the same time�. The third time I saw YES in concert here in Mexico City. 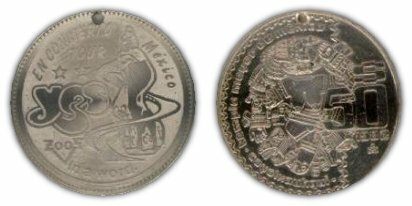 The other two concerts that I attended were in 1998 (Auditorio Nacional ) and 1999 (Palacio de los Deportes). I went to this concert with my brother Germ�n and his wife Paty. We arrived to the Auditorio Nacional (a very good place!) one hour before the start of the concert, and we have the chance to walk to the front of the stage to see YES`s equipment closer. 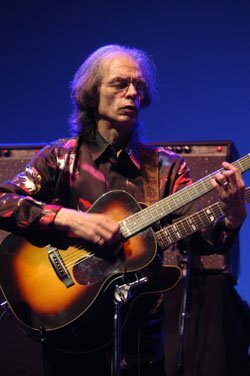 My brother (who is a guitarist and has his own recording studio) chatted a bit with YES`s sound engineer about some technology used for the concert. The concert started at 7:15 P.M.
-Siberian Khatru. A powerful version with an extended ending full of Howe`s lead guitar. After this song Anderson said �Buenas noches. It�s great to be with you. Thanks for coming to the concert�. -Don`t Kill the Whale: with some variations to the studio version particularly in Howe`s solo. -In the Presence of: Jon introduced this song as �this song is about all the things that are in nature. The Divine. The Divine". A very good song from the "Magnification" CD. Anderson played guitar in this song and in other songs. 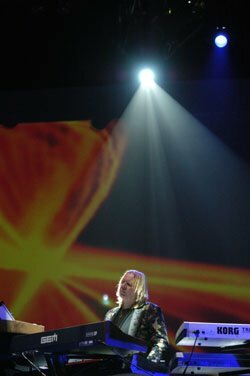 Wakeman looked like he was reading music sheets for the �Magnification� CD songs. -We Have Heaven / South Side of the Sky: I think that they used some backing tapes for the "Heaven" vocals. "South Side" included a keyboard`s solo section like the original "Fragile" version, but again with some improvisation from Wakeman. Howe and Wakeman interacted their solos in the extended end of this song. The audience gave them a long ovation. -Close to the Edge: a powerful version. Again, a very good solo by Wakeman. 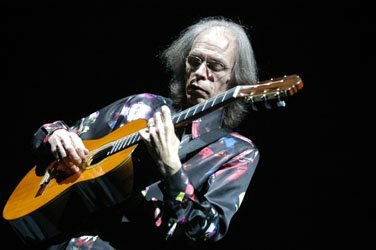 -Steve Howe Solo- Leaves of Green (from "The Ancient")/Clap: Howe explained (in English) that he wanted to play a song that he doesn`t play very often (�From Topographic Oceans , from �The Ancient�). After this, he said that he had to play �Clap�. -Jon Anderson`s solo: Show Me. Anderson first played a short song in his guitar that sounded very �World Music� in style. Later he played �a new untitled song about children, lost children of the world�, which was �Show Me� . 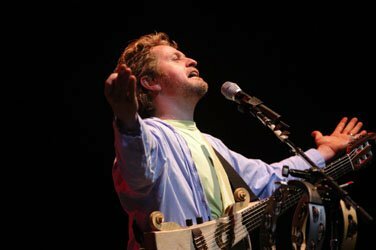 He was joined in the end of the song by Wakeman in keyboards, who clapped along with the audience `s ovation to Anderson. Then, Anderson said �on keyboards, Mr. Rick Wakeman�. -Wakeman Solo: some excerpts from "The Six Wives of Henry VIII" and some improvisation (including excerpts from a Christmas song!). -Heart of the Sunrise. 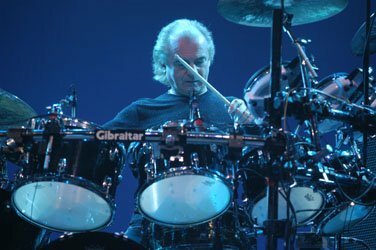 For this and the other songs originally played by Bill Bruford, Alan White played almost identical to the studio versions. Some members of the audience were singing loudly with Anderson �Sharp, distance...� The band was smiling to this audience chorus. After this song, which was followed by a long ovation from the audience, Anderson said �I`m really amazed. It�s good to be here with you in 2002, with you still listening to these songs 30 years later. Thank you very much�. -Chris Squire/Alan White solos- Whitefish/On the Silent Wings of Freedom. 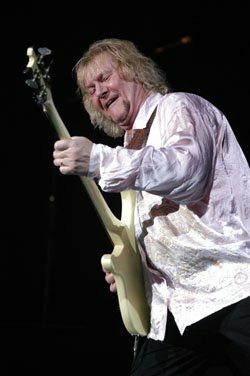 Chris Squire seemed having great fun in all the concert, particularly in these solos with Alan White . -Awaken: I waited a long time to listen to this great song played here. It is my favourite song from YES. They didn�t play it here in 1999 (as they did in South America in that tour). I enjoyed this song very much. It seems that many people were also enjoying it, because there was a long ovation after the song was finished. Wakeman added again some improvisation in the keyboards/percussion/harp section, while Howe was out of the stage for the most part this section and Squire was playing his 3 necked bass. Wow, what a concert. Twenty five years waiting to see Mr.Wakeman on stage. Since Siberian Kathru he showed why he is the best. 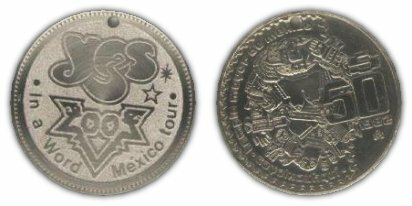 I had the opportunity to be on the 2 previous yes shows in Mexico city but somehow this one sounded different. It is a very good news that he rejoined Yes. 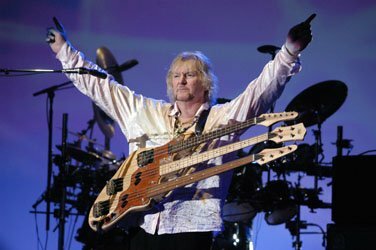 All the other members of the band were as good as ever, but specially Chris Squire and Alan White in their solo parts. Hope to Yes again soon. 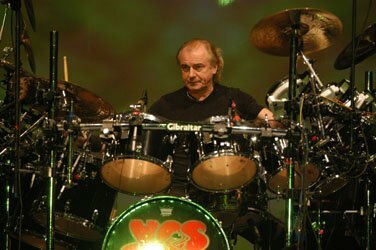 Never had interest in a Yes concert without RW. The Auditorium have what once was the largest organ in the world. Looking forward to see Rick Play a clasic on such a magnificent instrument. It would be very nice to see another Union YES performance, but I think (keeping each member in their respectable place)this concert is going to be the essence of something tha I call EDGE sound,I mean, when the whole LP enclosed visual representation of mucic (including Dean�s art). Thank for coming again and make the best for YESFANS in this country and over this latitude. OUR DREAM IS BECOMING REALITY��� TO SEE YES TOGETHER AGAIN HAS BEEN A DREAM TO MOST OF US... WELLCOME ALL OF YOU, BUT VERY VERY WELLCOME RICK WAKEMAN, BEACAUSE OF THIS IS YOUR FIRST TIME HERE, AND YOU WILL SEE WHY YES HAS COME TWO TIMES... AND AGAIN... AND YOU WILL COMEBACK ALONE WITH YOUR OWN WORK... I HOPE. BY THE WAY, YOU (ALL OF YOU, YES) NEED TO PLAY CLOSE TO THE EDGE, BEACAUSE IS ONE OF YOUR MASTER PIECES, PLEASE, DON�T FORGET THAT... WE LOVE YOU VERY MUCH, AND WELLCOME AGAIN.